Today is National Devils Food Cake Day! I am going to share a recipe with you, but you have to promise me that you will also temper some chocolate and dip these babies to add a "grand finale" to this recipe! 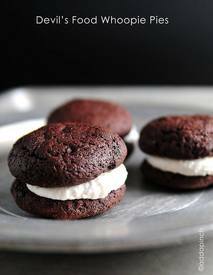 Do you know how many whoopie pies a person can eat before you realize you’ve eaten them?